When you walk in, you notice a vestibule in the winter where you have to go through another door so that cold air does not make patrons too frigid. I am a big fan of this since nothing quite ruins a meal like a some of the wicked winter sneaking into a nice cozy restaurant. Once you make it inside, the layout makes you think of a bowling alley because it is narrow and long. 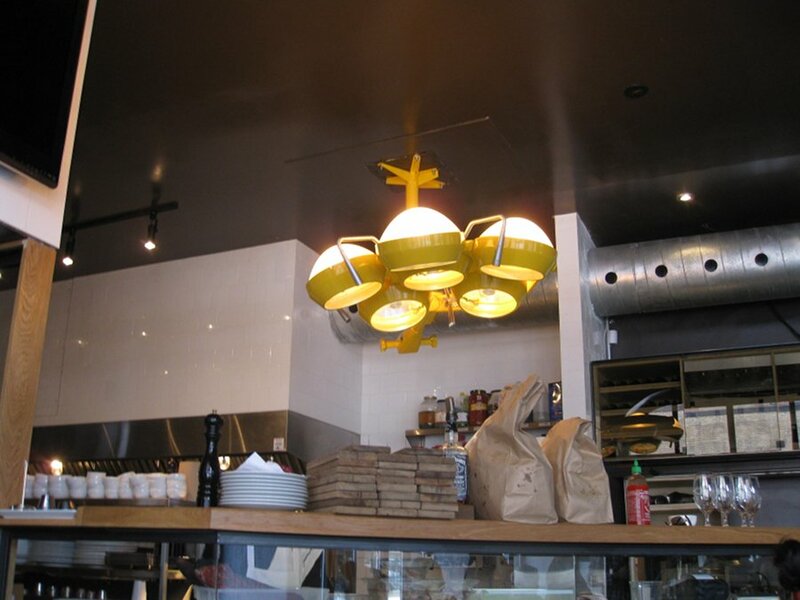 The décor is very cool with a large yellow light in the kitchen that reminds me of an old style surgical light. 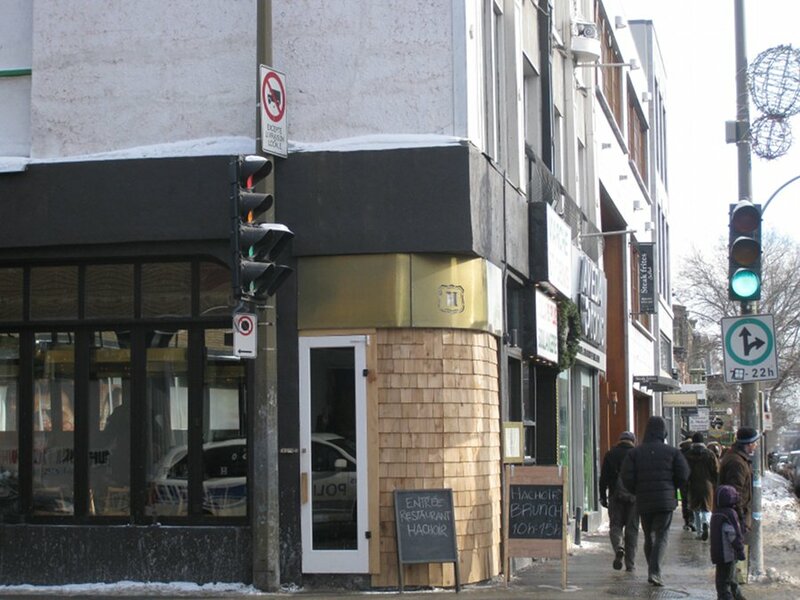 The place itself is rather well lit which is helped by being at the corner of Rachel and St Denis. The food comes served on these metallic cafeteria style trays with small compartments for food. I find this is funky spin on plates and made me chuckle. The menu is short at around a dozen items that are definitely classic breakfast/brunch inspired. I was concerned about it being focused only on meat or lunch items. From what I have read and heard, Hachoir specializes in burgers and can be a little meat centric, which is great for dinner, but not really a natural fit with brunch. What I found surprised me since the menu had a variety of the classic brunch staples as well as kids menu ($8.00). 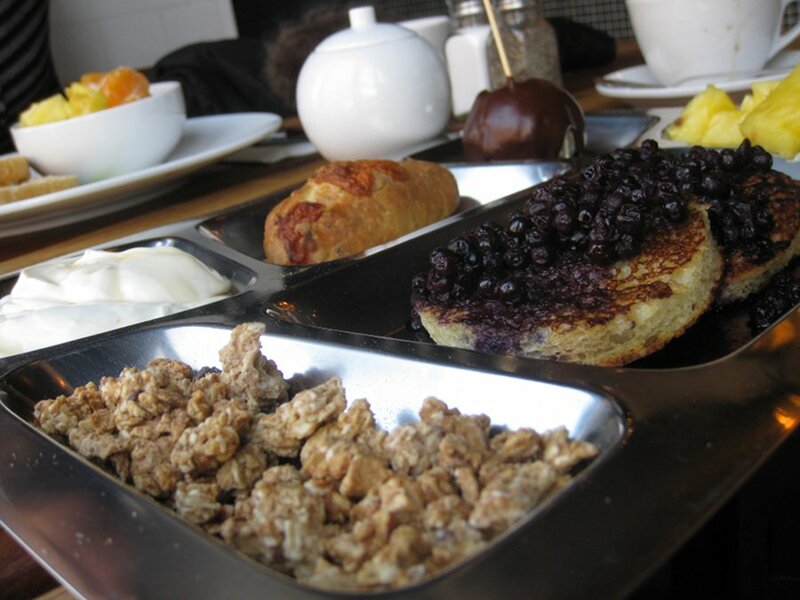 We started off with the sweet plate ($15) which is French toast topped with blueberries, yogourt with honey, granola, a tangerine dipped in chocolate, a cheddar pastry bread, fresh fruit and coffee. This dish is quite impressive as it has loads of varied items and combines tasty meal ideas with some fun creativity. The chocolate covered tangarine has a stick on it and you can eat it as a kind of giant lollypop which is amazing. The yogourt is tasty and you can add granola to it for that extra healthy kick. The French toast comes as two slices of an artisanal bread with loads of blueberries on top. Even though the French toast is only 1 slice, there is enough on the plate to fill you. This, coupled with the free coffee and refills, makes for a pretty good deal. My friend’s choice of Eggs in Window ($9) normally comes with meat on the side but she subbed it for fruit at no extra cost. The dish is actually 2 eggs of your choice in a window. 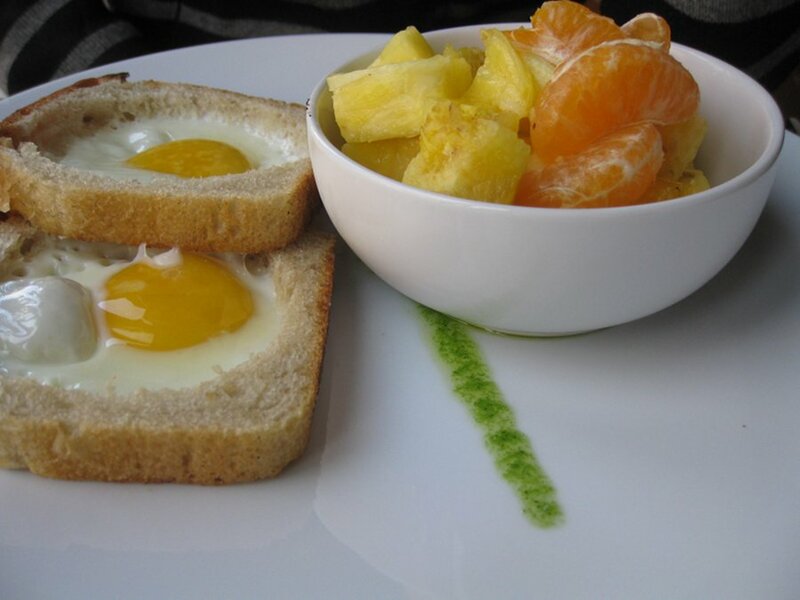 For those who don’t know what an egg in window is, it’s a toast bread with a hole in it and an egg in that hole. It’s a fun experience and the taste was decent although, in this case, the dish was simple with only a bit of fruit on the side. Potatoes would have been cool but at $9 with coffee included, I guess I can’t get too greedy. Our waiter was really cool and laid back. He did a nice job of helping to settle my difficult decision of the salty vs the sweet plate. Our refills were also quite frequent and our bill came on time without feeling like we needed to be rushed out. The menu is limited so don’t expect lots of vegetarian options but there are enough to still give you some choice. For vegans, there is the fruit option but nothing truly uniquely vegan. Hachoir is a nice addition to the area. I really enjoyed my dish and I loved the décor. While priced a bit high at $15, I did get loads of sides included and it came with coffee which if you consider it, makes it not too bad especially since other places will charge for coffee and will not have as many sides. The menu is short but I expect it to change over time so you can go a couple times and have something new and unique. I think the city needs more places like this and for that extra innovative kick, I would add this to my must-see list. The menu was simple but really creative as was the presentation. It had a fun urban feel yet all in a welcoming and comfortable atmosphere. The waiter was attentive and patient. I think this place will do very very and I would most definitely go back. I recently went last weekend to have brunch and was informed that they no longer serve brunches anymore 🙁 I realyl wanted to try it. I had no choice but to go to l’Avenue instead!